Two fun basketball games this week! Along with Mom and Dad coming to visit. Thanks for coming to see us! Another lovely one! It's Sat. and I am thankful! I have pictures of Jan and Michael's house fire. I will post them on Monday. Blessings on your weekend! Let's go out there and make it a great one! Famous words from "Oh what was the name of that movie?" Nuwanda!!! Seize the day!!! You tell me! I've been thinking alot this morning about Michael and Jan's house and their situation. They are being well taken care of by the insurance company, praise the Lord! They sustained around 70 thousand dollars worth of damage. Whew...anyway I hope that not all of Jan's lovely things that she had in her house are gone. She has such a way with decorating on a dime and everything looking so welcoming and beautiful. I am so proud of the how they are handling all of this. I think they foremost in their minds is glorifying God in it all. I think they are quite wonderful. I am also very thankful that no one was hurt and Jan was moved by the Lord to come home and catch it in time so that the whole house did not burn down. God is good. These are some pictures I took in their house about 3 months ago. Lovely. Sad news this morning. We got a call early this morning that my brother's house was on fire. Michael and Jan and sweet kiddos were gone to work and school when someone called that their house was on fire. We heard that Jan could see flames coming out of the roof top. We have not heard at this point yet how bad it was but prayers would be appreciated. Future garden? With hard work... maybe! Can't wait to put up a hummingbird feeder and watch these little amazing birds. What the backyard really looks like. Below: Dream for the front yard. Those bushes were planted in a really strange place right in front of the patio. I think they are Crepe Myrtles. Sid plans to move them to the side of the house in a row. We will see if they will move without dying. Wish we could tile the back porch, put in an outside fireplace with lots of plants around. Not happening of course except maybe for the plants. Help HGTV! For free please dedo my back porch and yard?! Front flower beds. Lots of work ahead. Just dreaming right now. :) Blessings. I wish you could hear what I hear. Good grief, why are boys and husbands included so competitive in EVERYTHING? First this morning it was ping pong with Will beating Wes, just a minute ago I heard, "shut up" coming from the dining room table where a heated game of "42" was going on. Wes is winning, and yes, I have told them for years not to say shut up. Wasted breath I think. I guess it could be worse don't you think? Anyway, enjoying a cloudy, maybe going to be rainy day and loving having everyone under this roof together. Nice. Hi! This is an interesting list of challenges that our youth minister gave to our youth group at church. Thought you might like to see it too. I think not only youth but older Christians can really strive for doing harder and bigger things for God. This does not necessarily mean you have to do BIG things but even memorizing scripture is really hard but so important in drawing closer to God. If I were writing this though at the top of the list to start on would be the challenge to just speak God's name in everyday conversation with everyone we talk too. 1. Start a prayer group at your school to meet weekly. Ask 10 people what your group can pray for them about. Do it weekly for the remainder of the school year. 2 Invite at least one person to a Bible study, worship service, or youth activity every day for 90 days. I guess this is retro day for me. Wes bought me an "Abba" greatest hits for Christmas I have been singing along and going through lots of stuff trying to get us all settled in this house. I was about there until Will decided to move home and go to school here! woo hoo! I love it but when he brought in all of his totally filled pickup load of stuff we had to kind of start over moving in. :) So...I have been listening to Mamamia, Take a Chance on Me, Super Trooper (why do I love that song so much? WEIRD.) etc. and going through lots of things. Wes is doing great. He went with his new youth group from church to Winterfest. Jeff Walling spoke along with many others and it was a great weekend. Very inspiring and a good bonding time for Wes. God is good. Good morning! This is the day the Lord has made, let us rejoice and be glad in it! The announcement below just came out in the USA Today. This picture below was taken on the day we first met Rachel. She is a lovely, beautiful person. Her heart is a beautiful as she is beautiful on the outside. She is kind and thoughtful and is focused on other people not herself. She loves Colt and most importantly she loves God above all else. We are thankful for you Rachel! 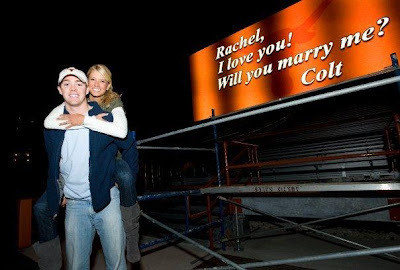 Colt McCoy and girlfriend Rachel Glandorf paid a visit to Darrell K. Royal-Texas Memorial Stadium on Monday night. They left as an engaged couple after McCoy proposed on the stadium's scoreboard. The message said "Will You Marry Me?" McCoy then followed by getting on one knee. Glandorf said yes. So while McCoy didn't win the national championship last week, he does get a pretty nice consolation prize. Well...maybe not strange but just different. I am having to remind myself that is just takes time to "fit in" when you move. Maybe a better way to put it is it takes time to find "where you fit" when you move. Having the house kind of set up and all of our "stuff" in helps it to feel kind of like home. I am thankful and happy about where we are and I know that things will start to feel comfortable sometime soon. This was an email I got on facebook last night from Mardi Andrews. National Championship! Go Longhorns! Go Colt! Well, this is the day. Whew...butterflies abound- in my stomach. I wish we were in Pasadena with the rest of the family! We will be yelling loud right here in our own living room. So proud of Colt and so proud of how he glorifies God. A few pictures of our house. These were taken when we first looked at it. I will post pics later of how it looks after it is occupied. My father in law came and helped us put in lighting and plantation blinds on most of the windows plus a million other jobs. I think we wore him out. Thank you DaddyBob!!! !